There are many unique dog breeds around the world, and even though we feature a rare dog breed every Monday it's easy to forget them. We put together a list of ten rare breeds with particularly interesting skills, qualities, or history. Here are numbers 10-6. Numbers 5-1 will be on the blog tomorrow. The Tosa is a Japanese breed of dog, at least 1,000 years old. They were traditionally used for dog fighting, and through the centuries the breed has changed from a small spitz type to today’s large and muscular dog. Before the start of WWII there were thousands of Tosa breeders in Japan, but when the country entered the war they made dog fighting illegal. In an attempt to discourage illegal fights, raising dogs of 150 lbs was also made illegal. The breed would have gone extinct, but a few of the most passionate breeders smuggled the last remaining dogs to northern Japan and hid them until the end of the war. Today, the breed has split into two groups. The Japanese bred are smaller and generally weighs between 80 and 135 lbs. Non-Japanese bred weigh between 135 and 200 lbs. With such a massive size it’s a good thing that they’re known for having a stable temperament. Back in the day when the Tosa was bred for dog fighting they had to be quiet, because Japanese rules demanded silence. To this day they rarely bark, but when they do it’s a deep rumbling sound that combined with the massive size efficiently keeps intruders away. These dogs are known to be fearless, brave, and intelligent. They are loyal to their family, but like all breeds they require training and socialization. The Canaan Dog is a natural dog breed from Israel that stems back to biblical times. This might be one of the world’s oldest still existing breeds; there are drawings of dogs looking just like it dating back to 2,200 BC. This was the herding and guard dog of the ancient Israelites. In modern times they’ve been recruited and trained as mine detector dogs, and at least 400 of them served in WWII. 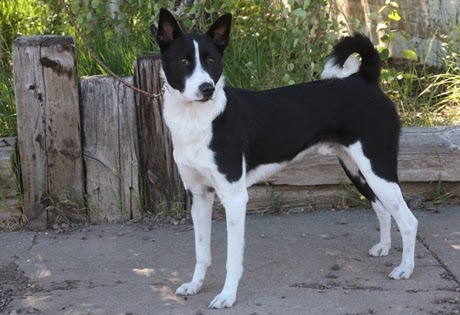 The average Canaan Dog is intelligent, easily trained, independent and territorial. Like all working breeds it requires ample exercise and a job to stay happy. They can often be seen winning dog agility trials, flyball, and obedience trials. The New Guinea Singing Dog is believed to be the rarest breed in the world, and has inhabited the island of New Guinea since the Stone Age. This is one of the most primitive breeds in the world, separated from other dog breeds tens of thousands of years ago. 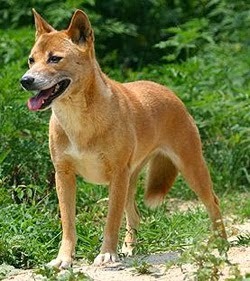 The Singing Dogs were originally thought to be a unique species, but were later grouped with the Australian Dingo as a wild-living subspecies of the dog. The first dogs left the island in the 1950s and since then the breed has adapted to living as a pet. The singing portion of their name comes from their distinctive and melodious howl. They are able to vary the pitch at will. Besides singing, the breed is known for its strong hunting drive, high intelligence, and ability to escape any house or yard. They are agile, and good at climbing and jumping. 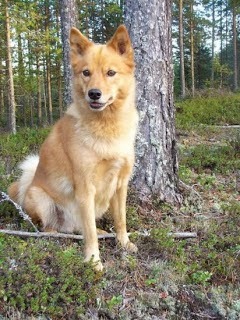 The Finnish Spitz is the national dog of Finland, known for its exceptional barking ability. The breed traces its roots back 6,000 years, and came to Europe around 2,000 years ago. In Finland, the breed is called Suomenpystykorva, and it is hailed in many patriotic Finnish songs. These dogs were bred to bark, and they can yodel. They bark up to 160 times a minute and Finland hosts barking competitions for them. Suomenpystykorva are intelligent, lively, quick, and active. A typical member of the breed loves children and gets along well with other dogs. The dogs are known to be tough. They were originally bred for hunting birds and small games, but despite the small size and cute appearance many tousle with moose and even bears. 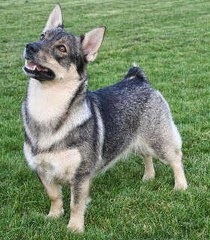 Svensk Vallhund or Västgötaspets is a sturdy and fearless dog with short legs that stems back to the Vikings over 1,000 years ago. It is believed to be the ancestor of the Welsh Corgi as it travelled to Wales with the Vikings in the 800s. These versatile dogs are popular in their home country of Sweden, and have traditionally been used to herd cattle, guard the home, and catch vermin. They’re known for being alert, intelligent, and affectionate. Besides performing their traditional duties they excel as show dogs and obedience dogs. The dog of the Vikings have some unique properties. It can be born with no tail, with a stub tail, or with a full tail. And, it is one of few breeds to be featured on stamps in a diverse range of countries such as Sweden, Nicaragua, Russia, Ukraine, Tajikistan, and Mali. Come back tomorrow for the rest of the list!